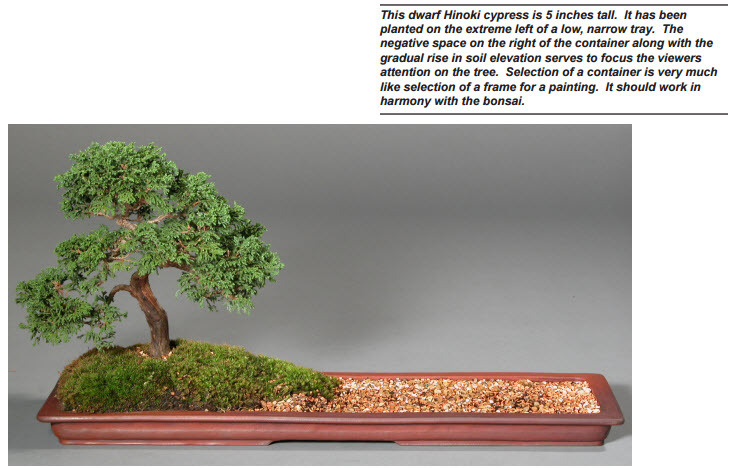 Selecting an appropriate container for bonsai involves the same thought and careful consideration as the selection of the frame for a painting. In both cases the decisions made can enhance or detract from the final impact the work will have on those who view it. The selection of an attractive, well made and proportional container can do much to increase a bonsai’s beauty and value. If the tree and container are matched effectively the whole will become more valuable than the sum of its parts. At the same time, the placement of a $5 tree in a $500 pot, will not necessarily create a bonsai whose retail value is $505. Base your selection of a container, not on its price tag, but on its suitability and harmony with the tree. This is not really as difficult as it might sound. Most of the guidelines applying to pot selection are common sense and will be instinctively understood by even the most elemental student of bonsai. It almost goes without saying that trees with massive trunks will look better in heavy containers. Likewise, trees with lighter elements belong in lighter and more delicate pots. 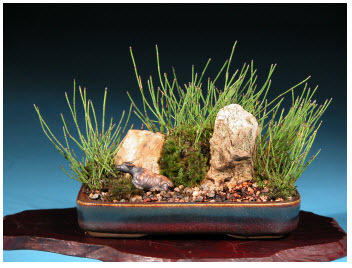 A cascade style bonsai belongs in cascade style pot and not in a shallow tray. Forest plantings tend to look better and give a better feeling of depth if they are planted into low wide trays. It is almost unnecessary to write such rules down. 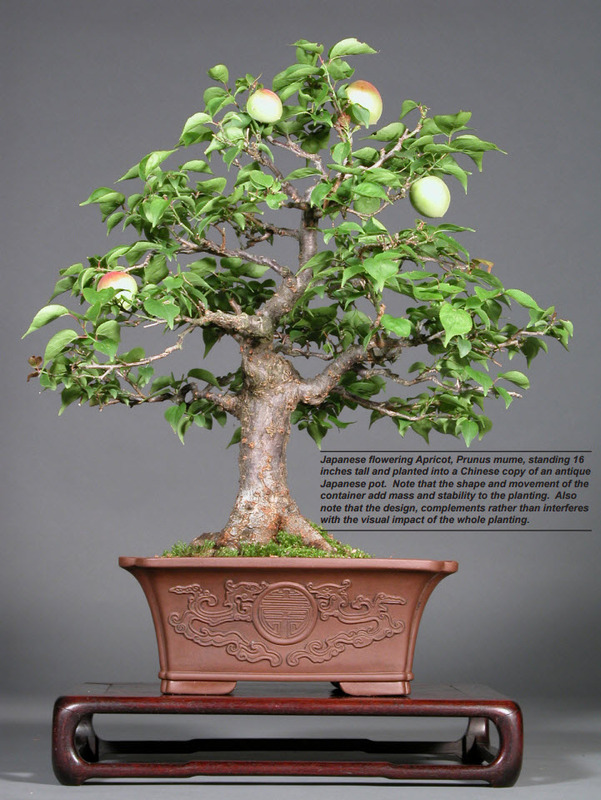 A capable bonsai artist who has spent even a little time in reading and has a clear understanding of balance and proportion will probably arrive at these conclusions by themselves. While a container is the “frame” for the bonsai “painting,” it is also the “home” in which the tree will be living for a long time. Bear in mind that growing a tree in a container is an unnatural environment for it. When God created little green apple trees (and all the other trees for that matter), his plan was to grow them in the ground. It was man who came up with the idea of putting them in pots. Aesthetic shape not withstanding, all bonsai containers are specifically engineered to provide an optimal environment for the trees roots to grow in. Even so, the containerization process places the tree’s root system at a considerable disadvantage and in a situation where damage may more easily occur. When selecting a container, the foremost concern must be for the health and safety of the root system. The tree must be provided with enough growing room to sustain its health and vigor. If this very important aspect is ignored, it will very shortly not matter how artistically well the tree harmonizes with the selected container. Newcomers, in their rush to achieve artistic perfection, are notorious for “rushing” their trees into containers which may look great, but are too small to maintain the health of the tree. Remember, it may often be best to temporarily set artistic considerations aside and overpot a tree until such time as it has developed horticulturally. 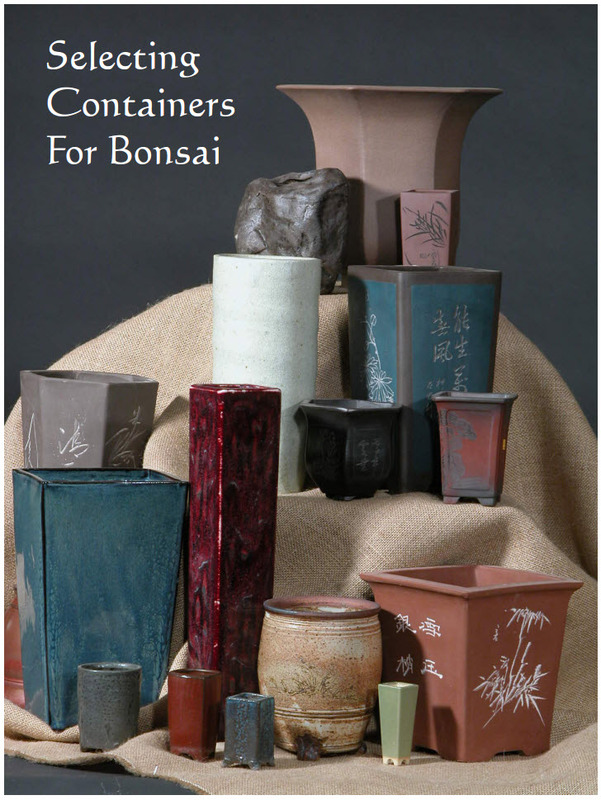 Today bonsai containers are readily available in a wide variety of shapes, colors and sizes. In the beginning only Japanese containers were available in the West. These were, and continue to be, manufactured to a uniform standard. Traditional Japanese pottery is elegant, subdued and place a heavy emphasis on containers which are either unglazed or dull glazed. They have become the standard by which all other bonsai pottery is measured. In recent years containers of Chinese and Korean manufacture have begun appearing in the Western marketplace. These non-Japanese containers still bear a marked Asian influence in their design and tend to follow established Japanese patterns. 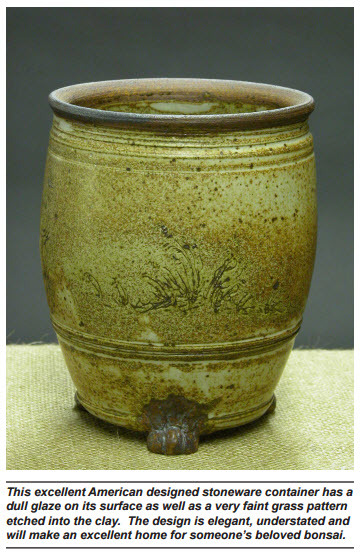 Western potters are also making inroads into bonsai container design. Using ideas gleaned from traditional Japanese and Chinese techniques, they are creating containers which are equally as suitable for bonsai, but make use of domestic clays and glazes. These Western made pots often demonstrate new approaches and viewpoints which reflect western concepts of shape and design. 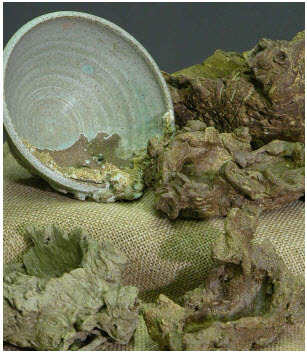 Regardless of its appearance or point of manufacture, any container intended for use in bonsai must incorporate two important elements usually not found in ordinary pottery. The first is the creation of substantial drainage holes in the bottom of the pot. This is important because perfect drainage is a key element in maintaining the trees’ health. Without holes the water would be trapped and roots would begin to rot. Secondly, all bonsai containers must have feet which hold them just slightly off the surface of the growing bench. Not only do the feet provide a little clearance for the drainage holes to do their job, but they also allow air to circulate under the pot and help to keep the root system cool. In terms of quality, containers used for bonsai span a wide range from very cheap to very expensive. These prices reflect not only the artistic aspects of the pot, but also the quality and skill used in its manufacture. Any given bonsai usually passes through a series of containers during the course of its lifetime. They can span a range from cheap plastic to high quality Tokonameware. As the tree develops in appearance and age the natural tendency is to provide a container of better quality. Bonsai people are fond of saying that the tree has matured to the point where it “deserves” a more expensive container. Pottery, whether intended for the dinner table or for bonsai, fall into three general categories. terra cotta; stoneware and porcelain. These three classifications are general references to the temperature and length of time the potters raw clay (known as green ware) was heated (fired) in the kiln. Terra cotta pottery is at the bottom of the ladder. It is fired at a relatively low temperature and only for a short while. This results in a pot with clay that is more porous and allows water and water salts to leach through the walls of the container. Such pots are generally unsuitable for bonsai use because they discolor quickly, decompose easily and are subject to freeze damage during the winter months. 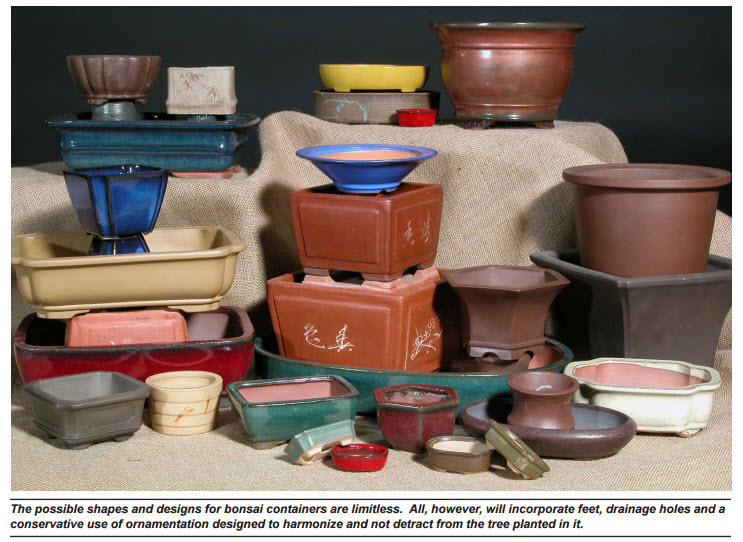 Most containers used for bonsai generally fall under the classification of stoneware. 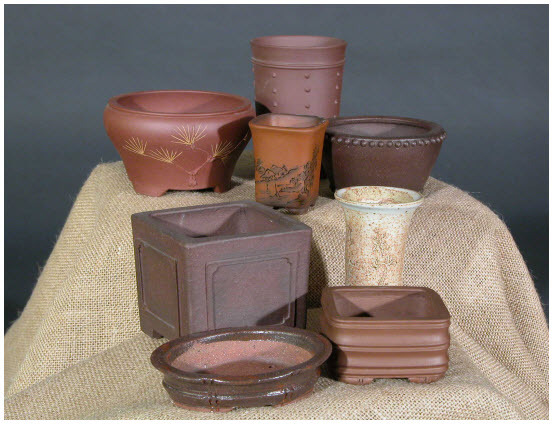 Stone ware pots are fired for longer periods and at higher temperatures than terra cotta. This causes them to be harder and less permeable to water. Even though stoneware is a vast improvement over terra cotta, there can also be a great variance in the quality of stoneware containers. The final category is porcelain. Generally, dishes and kitchen ware are made of porcelain. It is fired at extremely high temperatures and results in an extremely dense, and very hard finished product. Occasionally porcelain bonsai containers can be found, but they are not common. When trying to discern the quality and durability of a bonsai container it is advisable to consider the way in which it was manufactured. The cheapest way to produce a pot is through a process called slip molding. In this method, the liquid clay, or slip, is poured into a mold and swished around causing it to adhere to the walls of the mold. The excess is then dumped out. After the clay hardens it can be removed from the mold for the drying and firing process. The thickness in the walls of a slip molded pot can vary greatly depending upon the amount of time the manufacturer allowed the slip to remain in the mold before removing the excess. This means the quality can vary greatly. The second method is press molding. This is also sometimes referred to as injection molding. In this method a sheet or heavy slurry of clay is forced into a mold using two interlocking molds. This method is the one generally used for better quality pots produced for the mass marketplace. It usually results in a container with sharper, cleaner edges and produces a uniform clay thickness for every pot coming out of the mold. The final category are handmade containers. These are the most time consuming to produce. Some are made using a potters wheel and others are cut and assembled one piece at a time from rolled sheets of clay. Since this is the only method in which the hand and eye of the artist are totally in control of the final product, such pots are labor intensive and of a very high quality. Most hand made bonsai pots will contain a chop mark on the bottom of the container indicating the kiln of manufacture or will be signed by the artist. 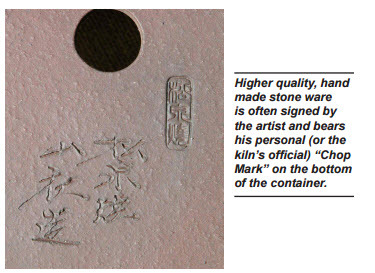 Its worth noting that the term used by bonsai people to reference very high grade pottery from Japan is “Tokonameware.” “Yi Xing ware” is the same term for high grade Chinese pottery. These terms are somewhat misleading because Tokoname and Yi Xing are geographical areas in Japan and China where a large number of both very good and very bad manufacturers of pottery are located. Unglazed containers with minimal ornamentation on the pot are the preferred standard for most bonsai. 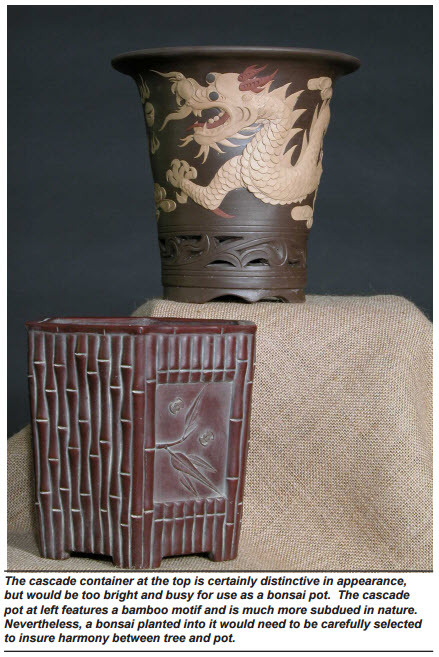 In the case of Japanese pots, the clay used is a dark brown. In the case of Chinese containers it is a dark earth red. Western potters adhere to these standards as well but also produce pots made from regional clays that reflect a wide variety of earth tones ranging from dark greys to egg yellows. When shopping for containers with a glazed finish it is worth noting that the preference among bonsai growers is for pots that have dull, subdued glazes. There are two reasons for this. First, a dull, understated glaze on a container is less likely to upstage and draw attention away from the tree planted in it. Secondly, dull glazed pots can only be achieved by high temperature firing; which, in turn, probably indicates a better quality pot. When considering a pot with ornamentation it is best to select something on the conservative side. Ornately decorated containers draw the viewers attention away from the tree they contain. Since the tree must be the main focal point in any bonsai composition, use of overly ornate containers would not be in keeping with the “less is more” philosophy at the heart of all bonsai. This is not to say that a pottery has to be boring in order to useful with bonsai. Just try and remember that the essence of bonsai’s spirit is simplicity. Such designs are not hard to find. Indeed, many Japanese pots will contain design elements such as bullet motifs or bands resembling bamboo. Others have interesting feet, corners, lips or subtle imprints in the surface of the clay. When selecting a container one should look for design elements which, in addition to being compatible with the tree, are unique and understated. Such designs add interest to the whole without detracting from the total composition. 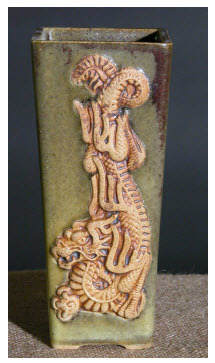 As an example, dragons are a popular item among bonsai people and many containers for bonsai feature them. 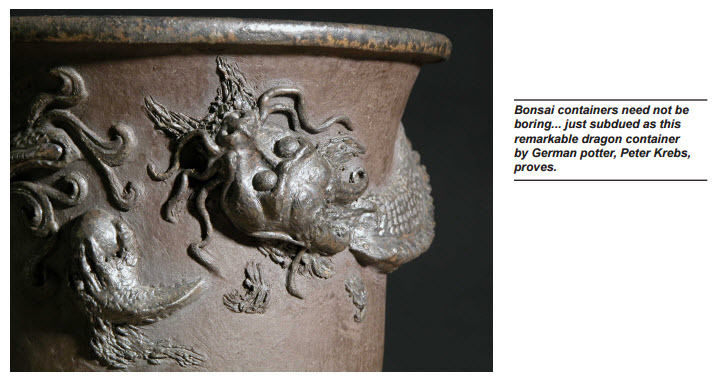 A pot with a twisting, turning serpent might work well with a tree whose primary aspect was a twisting, turning trunk. It would also be completely inappropriate for a forest planting or a more upright tree. A grass or bamboo design etched into the surface of a pot might harmonize well with a forest grouping or with a wildflower, kusomono type compositions. Many possibilities exist but the ultimate choice belongs to the artist. In making that choice it is well to remember that the guidelines which govern the selection of bonsai containers have been developed over many hundreds of years. They have not changed greatly for centuries and are still followed today, primarily because they work. If the container you select has feet and drainage holes and provides enough growing room for the trees roots then you have met all of the pot’s horticultural requirements. What remains to be determined is the aesthetic appearance of the pot and how well it will harmonize with the tree planted in it. The “finished” bonsai is not a miniature tree independent of its container, but the combination of the pot and tree together. Which container the artist finally selects should be based on the guidelines set forth below. The Japanese have a saying. “Less is more.” It means that the simpler you can make a thing, the more impact it will have. Containers used for bonsai are traditionally understated and always defer aesthetically to the tree planted in them. Remember this when you are picking out your pot. It is also well to remember that the selection of a container does not need to be a final one. Periodically changing the tree’s container can give the bonsai an entirely new look. Since there really is no such thing as a “finished” bonsai this is completely at harmony with the way our trees themselves change throughout the seasons and years. With the exception of number one, it should be remembered that these are guidelines, not hard fast rules and are not set in stone. Bonsai is art… not science. In order to grow and develop it needs the ability to remain fluidic. What few rules it does have therefore function best when they are allowed to bend and on occasion break. 2. An unglazed container is always correct for any tree and usually mandatory for evergreen bonsai. 3. Glazed containers are usually reserved for deciduous trees or trees which bear flowers or fruit. The color of the glaze is selected to compliment some element of the tree. 4. Trees which exhibit “masculine” design elements should be planted in containers which are angular. Such elements might include, angular trunk movement, sharp downward branch movement or extensive use of jin and shari. 5. Trees which exhibit “feminine” design elements are best planted in containers with soft flowing lines. Such elements might include gentle trunk movement, curving branch patterns or rounded crowns. 6. For most bonsai the width of the pot should be a little more than 2/3 the total height of the tree. 7. In situation where the tree is wider than it is tall, the container width should be slightly less than 2/3 the spread of the left and right branches. 8. The depth (top to bottom) of a pot should be about the same as the width of the trunk base at its widest point (unless this rule conflicts with rule #7 or #1). 9. The width of a container (front to back) should be slightly narrower than the spread of the longest branches in the front and back. 10. The container selected should always be visually subordinate to the tree planted in it. i.e. – Keep it simple!